Bread & Puppet Theater in the Boston area for 2 "circus" performances during Labor Day weekend. "The Overtakelessness Circus" performed on Magazine Beach Park in Cambridge, MA and as part of the Bread & Roses Heritage Festival in Lawrence, MA. CAMBRIDGE, Mass. 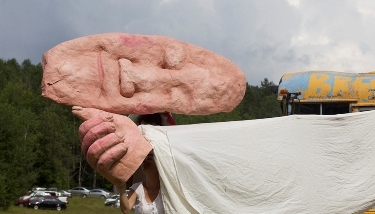 - Aug. 19, 2015 - PRLog -- The award-winning Vermont-based Bread & Puppet Theater takes its annual Labor Day weekend "little big tour" down to the Boston area, this year bringing their new The Overtakelessness Circus to be presented outdoors on Sunday, September 6th, in Cambridge at Magazine Beach Park and on Monday, September 7th, in Lawrence at the 31st Annual Bread & Roses Heritage Festival. The Overtakelessness Circus presents the most popular races and competitions of modern life and its economy, including the race between the proletariat and the CEOs, and the race between the limping city pedestrian and the sports car in a typical traffic jam. The Circus will also commemorate several historic events that do or do not influence modern life, such as the 800th Anniversary of the Magna Carta and the 30th Anniversary of the federally supported firebombing and destruction of the MOVE Family in Philadelphia. "The overtakelessness of all that which runs it’s fatal or ridiculous course. The running of all aspects of modern life towards it’s high-falutin' goals and pitfalls. The running itself is the subject matter." As always with Bread & Puppet outdoor events, The Overtakelessness Circus features a brass band, a string ensemble, various birds, tigers and cockroaches, and a vast array of representatives from all categories of the human hodgepodge. If some of the circus acts are politically puzzling to adults, accompanying kids can usually explain them. After each performance, sourdough rye bread will be served and the audience is welcome to stay and check out all the masks and puppets and to peruse the Cheap Art, posters, and banners for sale. For more information: www.magazinebeach.org/events, www.cambridgema.gov/arts/Programs/summerinthecity/summerinthecity2015, 617-286-6694. Presented with assistance from the Cambridge Arts Council and the Cambridgeport Neighborhood Association. For more information: www.breadandrosesheritage.org, 978-309-9740. Presented as part of the Annual Bread & Roses Heritage Festival, an open-air social justice celebration. Now in its 52nd year, the Bread & Puppet Theater is one of the oldest and most unique self-sustaining nonprofit theater companies in the United States. The theater champions a visually rich slapstick style of street-theater that is filled with huge puppets made of paper maché and cardboard, combined with masked characters, improvisational dance movement, political commentary, and a lively brass band. The company’s performances are described by The New York Times as "a spectacle for the heart and soul." Bread & Puppetis based on a farm in Vermont's Northeast Kingdom. The theater was founded in 1963 on the Lower East Side of New York City by Peter Schumann, a German born artist-dancer, and for the next decade his giant puppets figured prominently in anti-Vietnam War demonstrations in New York City, Washington DC and other cities in the US and abroad. Indoor performances were both simple and more complex, ranging from quiet, intense masked shows ("Fire", "Man Says Good-Bye") with 4-6 players, to huge, lengthy spectacles ("Cry of the People for Meat").